All cylinders supplied with a DIN/Yoke combination valve. Please specify whether you would like a right hand valve or left hand valve when ordering steel cylinders. If a valve is not specified a right hand valve will be sent with cylinder. 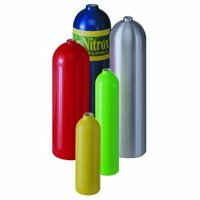 All cylinders and valves are Oxygen cleaned, oil free, and sealed at factory for Nitrox use. All diameters and weights are nominal. Lengths and weights do not include valve and boot. Buoyancy listed is in salt water, tank only. Cubic foot capacities listed are nominal and actual volume depens on settled pressure, temperature and gas being filled. Free shipping not available on most cylinders.